Hi, my name is Magda and I’m working for SMB Services for the DACH (Germany, Austria and Switzerland) market. I studied International Management in Berlin and have been working at Google for one year now. I am based in Wroclaw, Poland. 2. What's the coolest thing about your job? My Team. I get to work in a great environment with amazing people. We work together very well and I learn a lot from others, be it, team Leaders or peers. I really enjoy the fact that hierarchy is less important than in other companies; even though people may be more senior and have more responsibilities, everyone is approachable and interested in what you have to say. In my core role I get to learn about Google’s products; not only AdWords, but also YouTube, G+, Local and other fun stuff you can use. With every client interaction, you get to know Google a bit more and it is a great learning path. I always dreamt about working in Wroclaw ever since I heard from friends that there is a Google office there. At some point, I visited Wroclaw (I was studying in Berlin back at the time) and came to the office during a Start-Up event. I fell in love with the atmosphere and the unique work place with great, approachable people. I immediately felt at home and applied for a job the following week. 4. What makes you Googley? I was very lucky to be born into a multicultural environment. On top of the ability to master different languages at the youngest age, I also learned about differences in cultures, habits and approaches. In a company like Google, this is definitely an asset, because we are working with people from different nationalities and backgrounds on a day-to-day basis. I am very energetic and I am also always glad to help in any possible way. It is important to be a good team player and to enjoy this vibrant environment we have in our young Wroclaw office. The University Programmes Team EMEA proudly presents ‘Day in the Life of an SMB Account Strategist’ Hangout on Air on 13th March 2014 from 14:30 - 15:30 GMT. You can find out more information here; don’t forget to click attending! To read more about the roles available, please visit our SMB Sales and SMB Services roles on our job site. 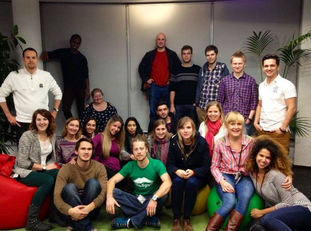 Ever wondered what it is like to work as an SMB Account Strategist in Google EMEA? Then read on! 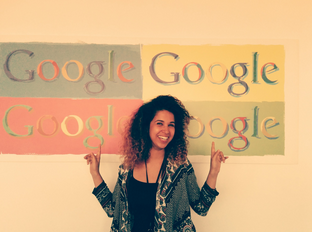 Magda Gameel is an SMB Account Strategist (German) in Google Wroclaw. Magda will be taking part in our ‘Day in the Life of an SMB Account Strategist’ Hangout on Air on March 13th. You can find out more information about the Hangout and how you can get involved at the end of this post.